We’re not your ordinary green, organic, non toxic, truck mount steam, deep, carpet cleaning service. 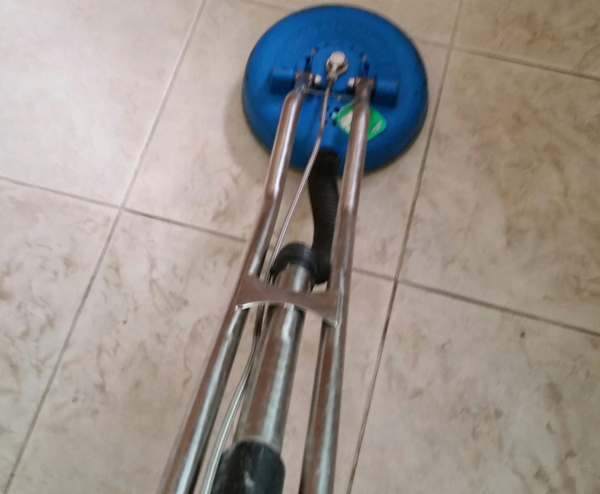 With over 2 decades of expeience we are a full service carpet care company that also provides Tile and Grout cleaning, upholstery cleaning and carpet repair ranging from carpet stretching to your bleach stain color dye repair. A local veteran owned & operated services since 1994. 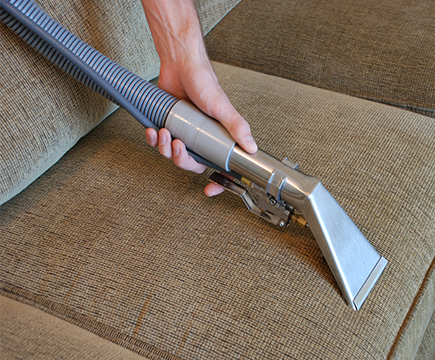 Schedule Your Safest Steam Carpet Clean Service Today! 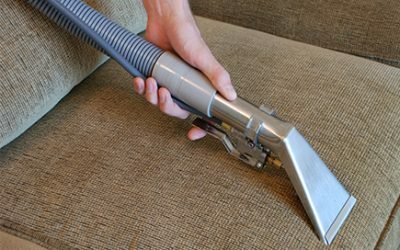 Miracle Services Green Carpet cleaning uses true Environmentally Friendly cleaning solutions that are natural, green, organic and hypoallergenic. No harsh chemicals. This non-toxic, no soap cleaner is chemical free and completely rinses away along with the dirt leaving no soapy or chemical residue behind. Our prime human safe solution is typically found in food or drink and considered FDA food grade products. True eco friendly cleaning. These solutions contain all natural ingredients – no petrochemicals, carcinogens, perfumes, surfactants, phosphates, NTA, EDTA, alkali builders, acidic or volatile organic compounds. The best part is that our cleaning solutions are healthier and completely safe for us the daily user and thus for your family. Many that use us are allergy sufferers, people with a comprimised immune system, those that are sensitive to chemicals or fragarences and mothers going through nesting syndrome. Since we don’t leave a soap or chemical residue and do not use harsh chemicals we are ideal for those situations where children and pets crawl on the carpets. We are extremely strict on all things we use to ensure our safety since we are constant users of our products that I require to be human safe first. Natural is good, yes, but our natural has to be human safe, there is a big difference and this is what fools many users and consumers. Many natural environmentally friendly things exist that are poisons and are not safe for humans. We avoid all non- human safe products. When we get into your home I encourage you to ask what we use and to google the listed ingredients for yourself, Green sells and there are many fakes out there. We do not use the product Procyon or like some Franchise convert water into sodium hydroxide which is caustic lye. Our cleaning solutions carry many certifications such as: Envirodesic, Environmental Choice, Eco-Label, Carpet and Rug Institute, Woolsafe and other many supporting organizations. When safe non-toxic ingredients and quality matters call us. Our signature fast dry service is an option and recommended during the humid season and winter rainy days. Every bit of our cleaning routine is about moisture control. As carpet repair experts we know carpet backing and the extreme importance of not getting it wet. Today’s carpet backing consist of polyester mesh coated with only 20% latex and 80% clay. It used to be the other way around. So you can see that our focus is also on preserving the integrity of your carpet backing. We also specialize in drought friendly carpet cleaning with our Low Moisture steam clean to Dry cleaning methods when water saving and water restrictions apply. We are masters at this. 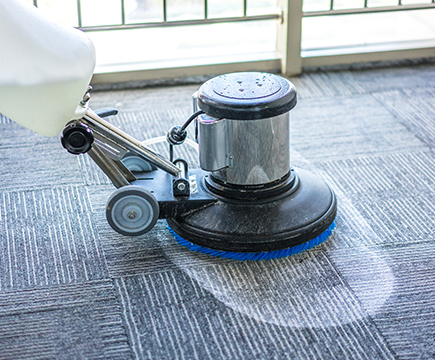 Most of our commercial carpet cleaning service is a dry cleaning method or a combination of truck mounted hot water extraction. Commercial carpet is very much different than residential carpets. Don’t forget, our signature fast dry service is always available at request. It’s a necessity for jobs with miscellaneous spills that have entered the backing and pad that will probably wick back up during the drying phase. I highly recommend it for rainy day service or cloudy humid days. Our unique patented 360 degrees down draft fan dryers expedite the evaporation process like no other. 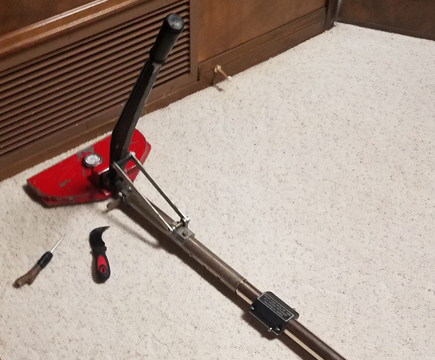 It seems every home with carpet 80% of the time requires some sort of repair. 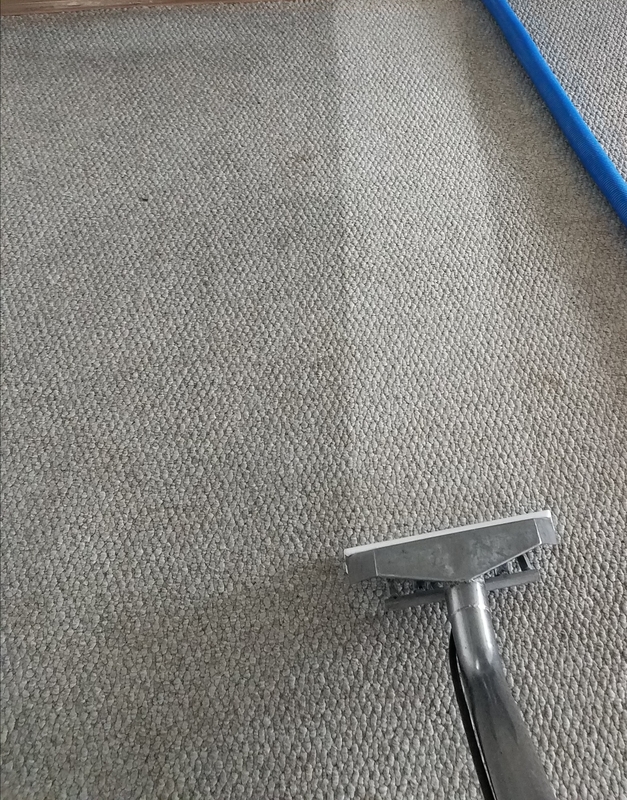 There was a time when all carpet cleaners knew their trade and your carpet was fully serviced during your cleaning visit. We can provide those needed repairs whether it’s a patch, re-stretch, carpet stretching or spot dye color repair. Your residential carpet warranty is usually for 25 years and comes with exclusions. The most important one is “cleaning periodicity”. You are required to get a cleaning within 12-18 month depending on your warranty to keep it in force. Another exclusion is damage or cleaning method. Dry cleaning can void your warranty due to damage such as “tip blooming”. 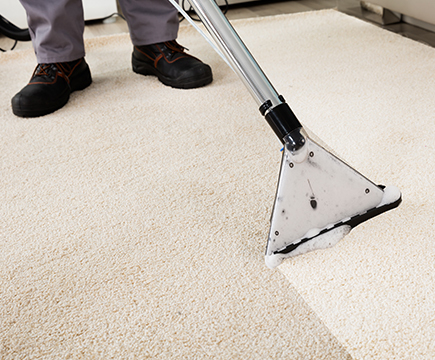 Although dry cleaning is an oxymoron and rearranges dirt it also can damage carpet fibers. This is why we will only use Hot Water Extraction method via truck mounted steam clean all residential accounts. Many carpets have wrinkles due to bad subcontracted installers, your install warranty is only good for 1 year! They know this. Call us for a post install inspection. 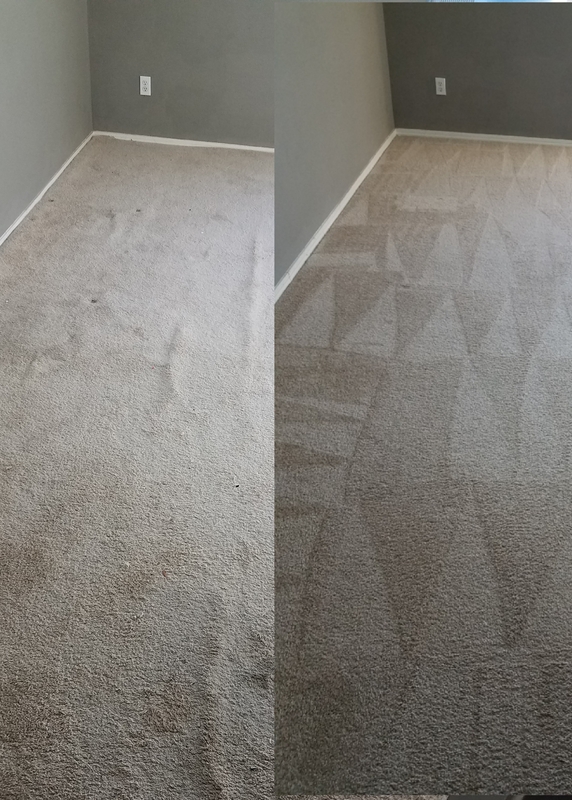 Call us to clean at 15 months and we find loose carpet then getting it fixed is on you. Yes, we constantly repair these but it shouldn’t be this way. 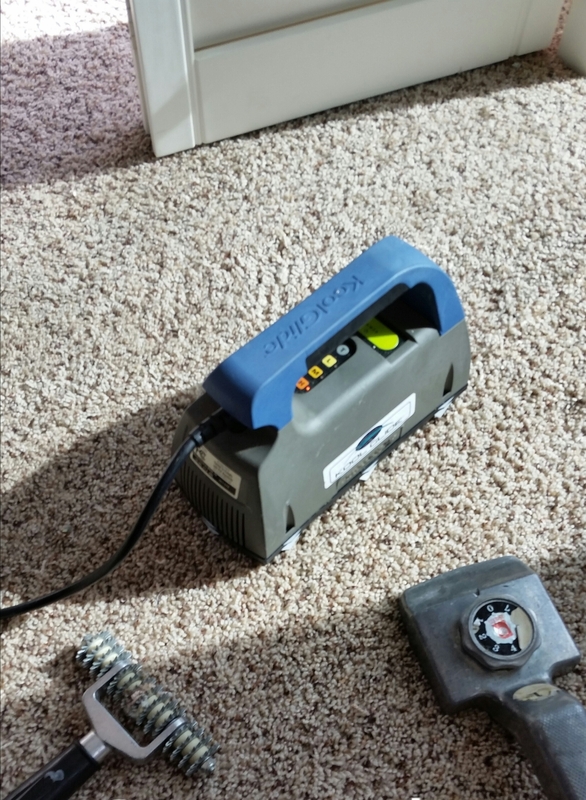 If it wasn’t installed correctly then your 25-year carpet warranty is void! 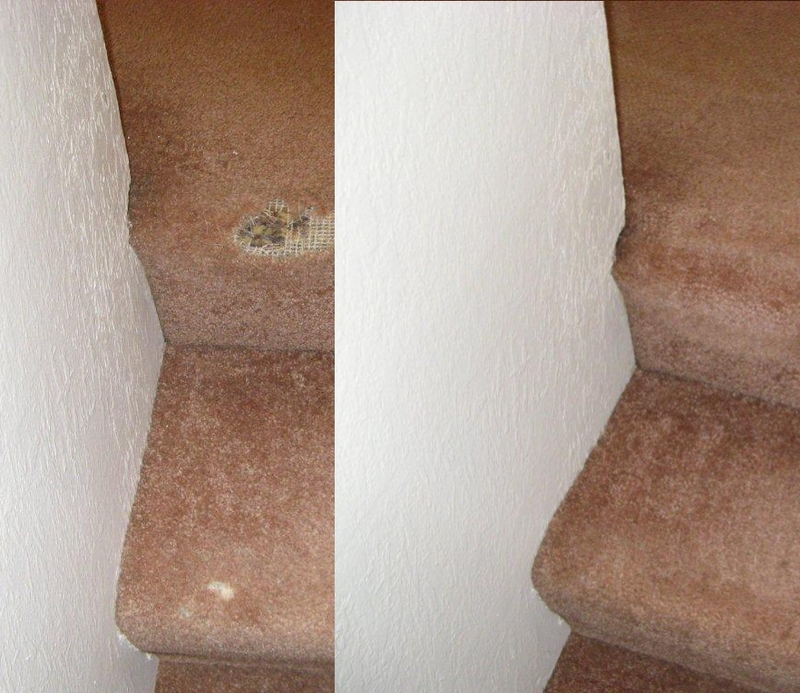 Higher standards, better results and full service in all carpet care. All of your carpets get deeply cleaned. 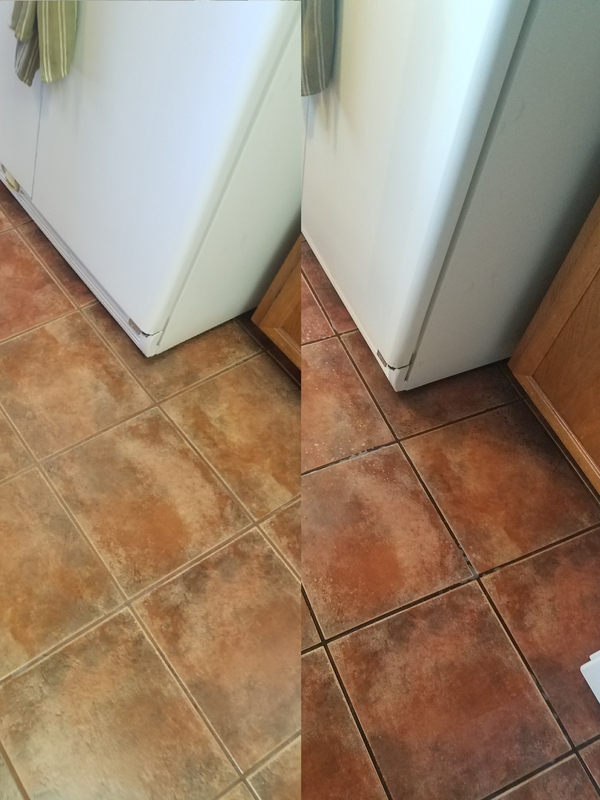 We can transform your old stained grout. 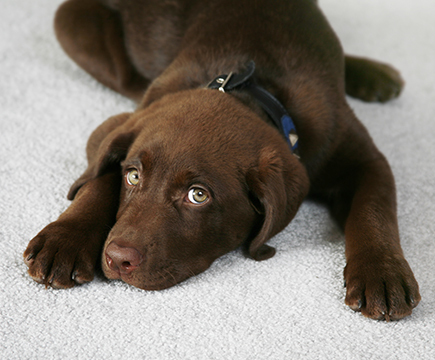 We are the experts on fixing burnt carpets, carpet pet damage, loose carpet and other carpet repairs. 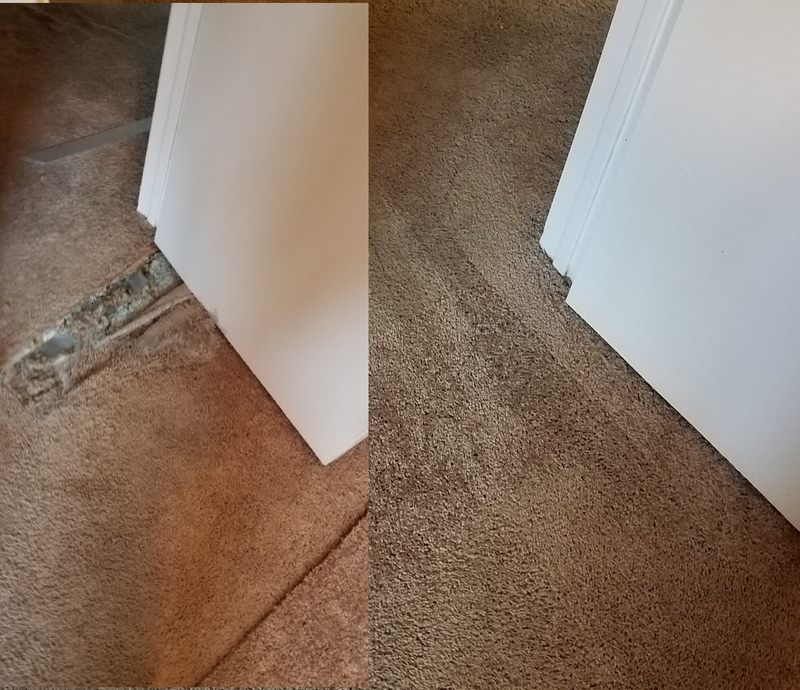 The picture on the side is where we cleaned a “Hi” in the room where the carpet was dry a few days prior and the client complained of crunchy stiff fibers that still smelled dirty. This method is only applied to commercial building cleaning for commercial plastic ole-fin fiber. For your home let’s get the dirt gone! It’s your sanctuary. Let’s not leave any soapy or chemical resides and keep it organic if possible. Let’s be honest, we do run into some very bad situations that will not be organic. We use only the best-proven tools to apply to each situation. Give us a call, schedule your appointment in advance and enjoy a professional, non-residue, perfectly natural and a clean & dry cleaning for a change. Sabre Springs, Rancho Penasquitos, Mira Mesa, Scripps Ranch, Tierrasanta, Clairmont, North Park, La Mesa, Bonita, El Cajon, Harbison Canyon, Crest, Rancho San Diego, Jamul, Dulzura, East Lake, Santee, Lakeside, Alpine, Pine Valley, Descanso, and more.